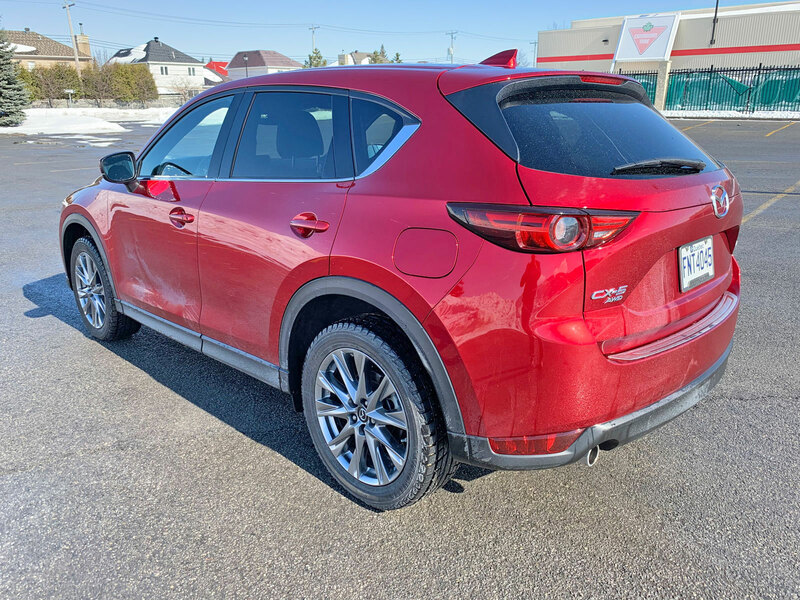 The CX-5 was introduced as a replacement to the CX-7 five years ago and underwent a re-design for 2017. 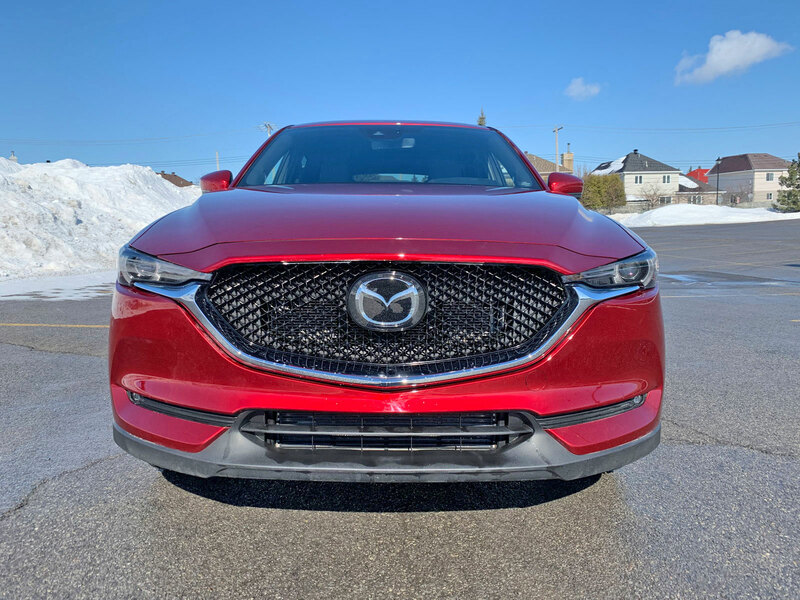 As Mazda’s best-selling vehicle with over 2 million units sold worldwide, it continues to enjoy huge sales growth south of the border though sales have been roughly the same as years prior here in Canada. 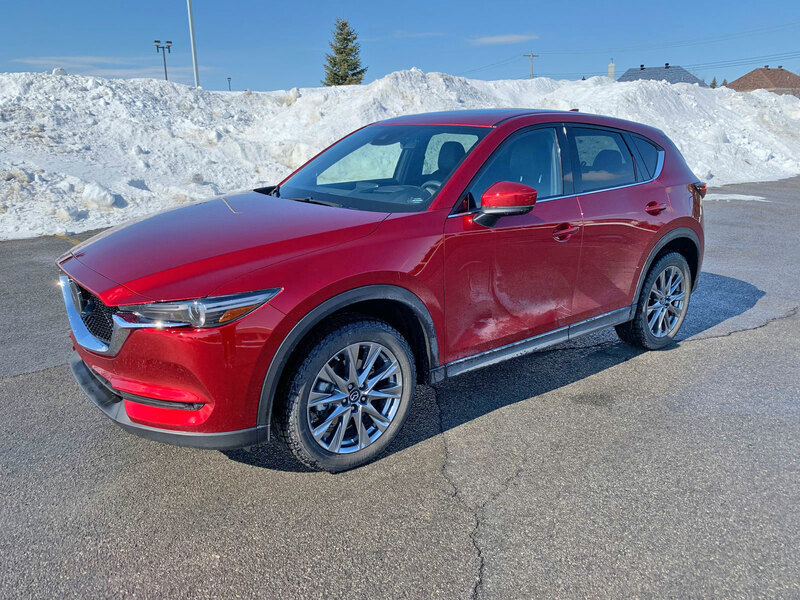 For 2019 the CX-5 has brought notable upgrades to the table with the addition of a new top-of-the-line Signature trim, a new optional 250 horsepower, 310 pound-feet of torque SKYACTIV turbocharged 2.5-litre four-cylinder engine, the latest G-Vectoring control technology and Apple CarPlay/Android Auto compatibility. The look remains essentially the same which isn’t a bad thing because Mazda’s design language is classy, sporty and easy on the eyes. 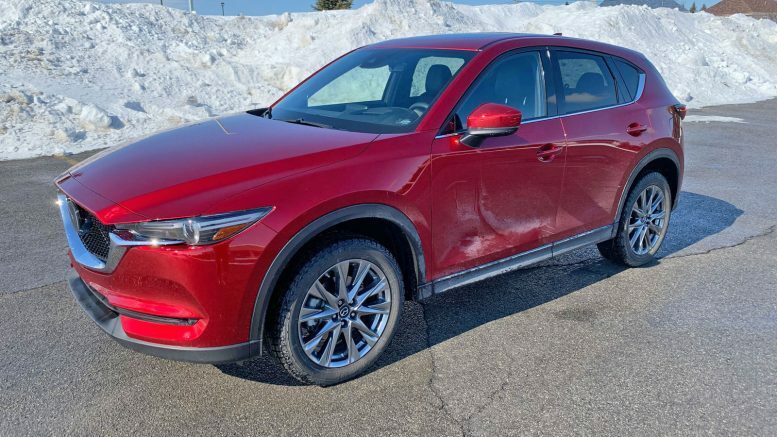 With addition of the Signature trim level in the CX-9 and the Mazda6, Mazda’s flagship SUV and sedan, respectively, it was natural the brand would follow suit in the popular CX-5. The new Signature trim has features such as Caturra Brown Nappa leather seats, genuine layered wood trim, satin chrome accents, a leather-wrapped steering wheel with unique stitching, ambient interior LED lighting, a black headliner and a frameless rearview mirror. 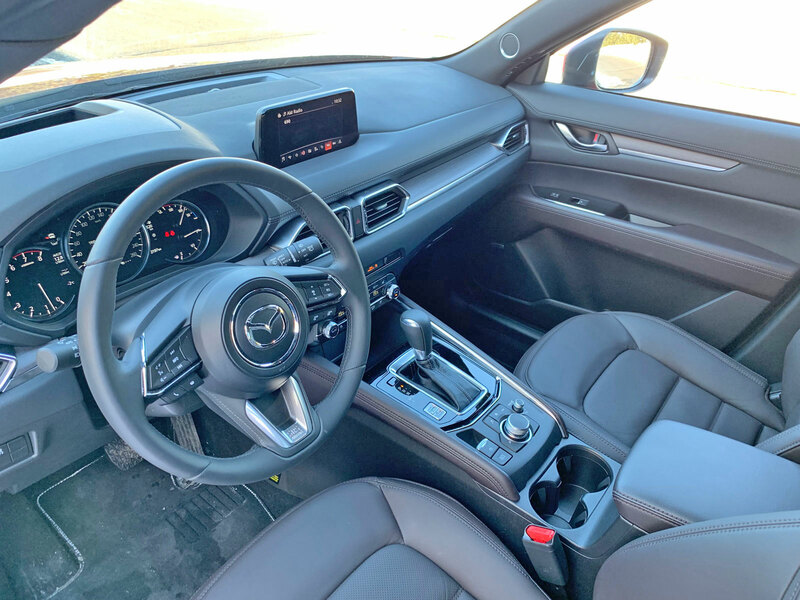 The interior of the Mazda CX-5 struck me as more luxurious and expensive than I was expecting. 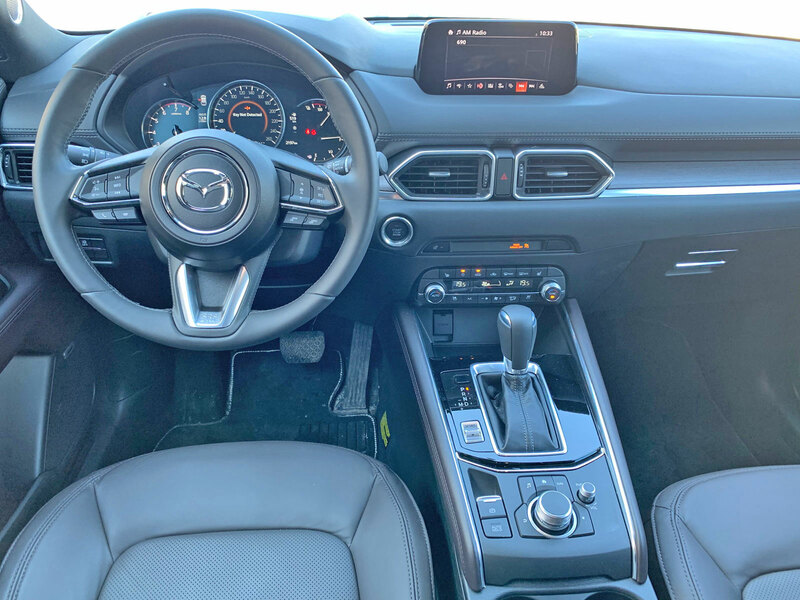 Mazda has done an excellent job with the dashboard layout and control functions. This is an underappreciated fact in automotive circles in my opinion. Everything is right where is should be and well within arm’s reach. There are proper dials and knobs for climate and volume controls making basic vehicle operation a breeze. 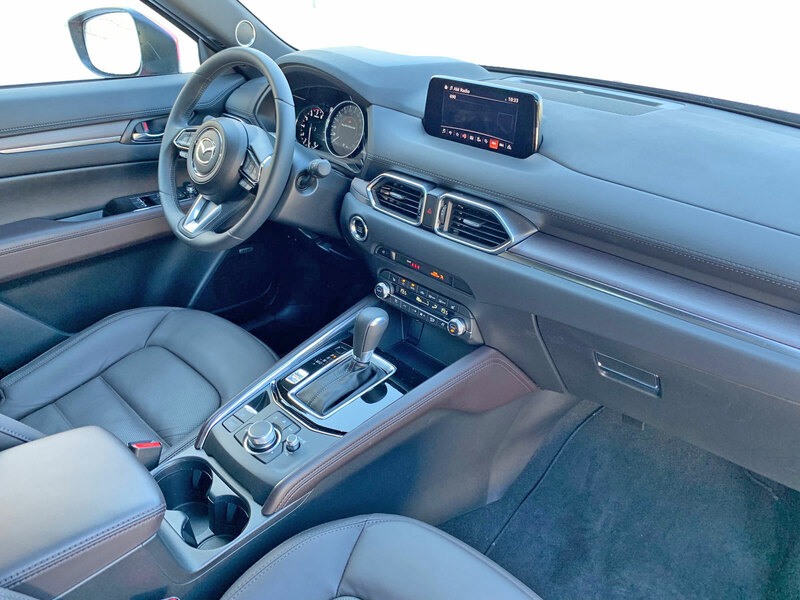 The brand’s philosophy is to only have critical driver data displayed on the instrument panel while entertainment data is relegated to the 7-inch infotainment screen. Similarly. 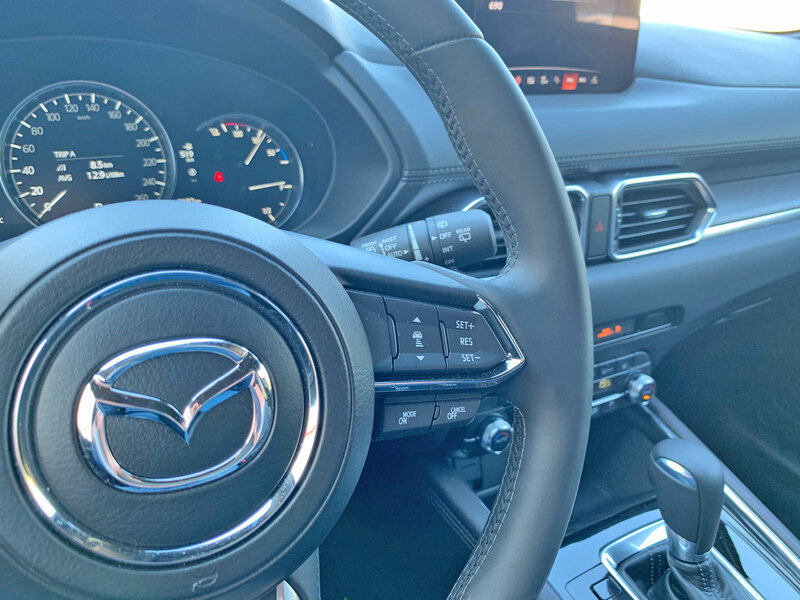 I cannot say enough good things about Mazda CONNECT, the brand’s intuitive and easy-to-use infotainment system. Some manufacturers struggle mightily is developing layouts which make sense but not Mazda. The Commander interface features a dial on the lower console where the driver can manipulate it without looking down. My favorite feature is the volume knob location next to this command wheel. 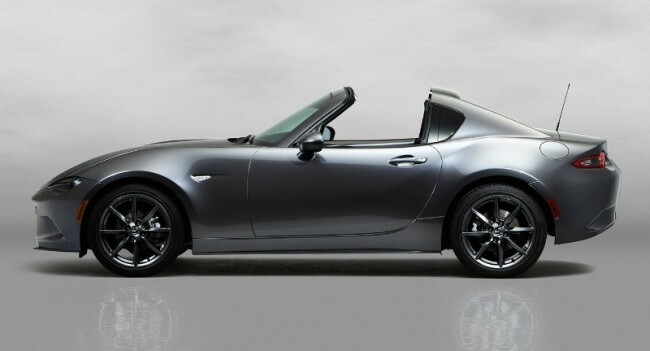 Mazda is one of the only automakers that put it where it should be. After falling several years behind, the brand now offers Apple CarPlay and Android Auto functionality in its vehicles. Mazda wanted to be sure that they could program CONNECT to work with the new applications to their satisfaction. 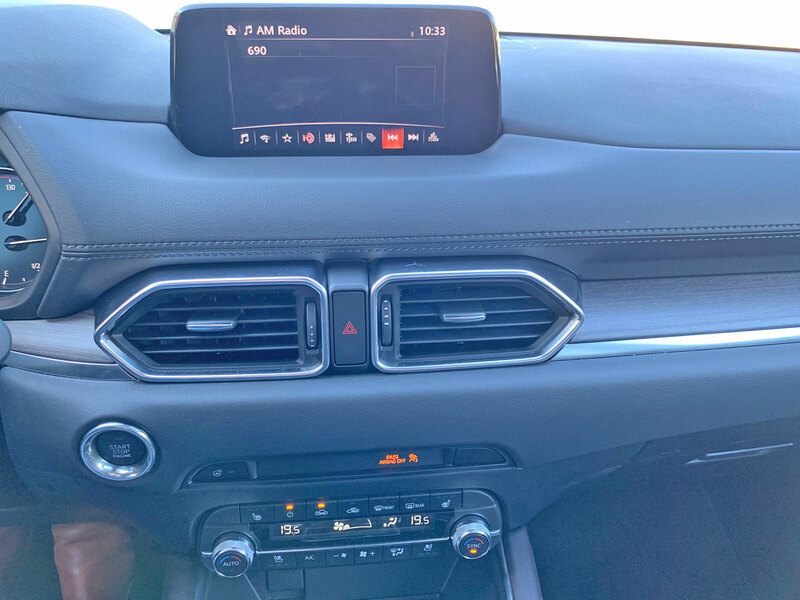 Small details like if you’re using your smartphone navigation and you wish to change the radio station then return to the navigation screen, CONNECT will return you to the smartphone navigation rather than the cars default navigation (that you weren’t using). 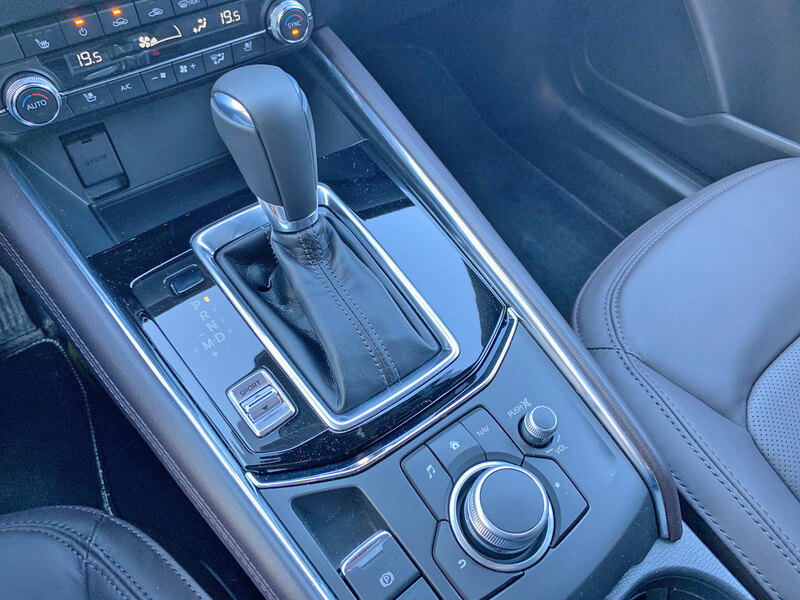 Most Mazdas that use the new interface going back to the 2014 model year are eligible to be upgrade for a fee at a dealer. As mentioned above, there is a new turbocharged engine available as an option on the GT and standard on the Signature. 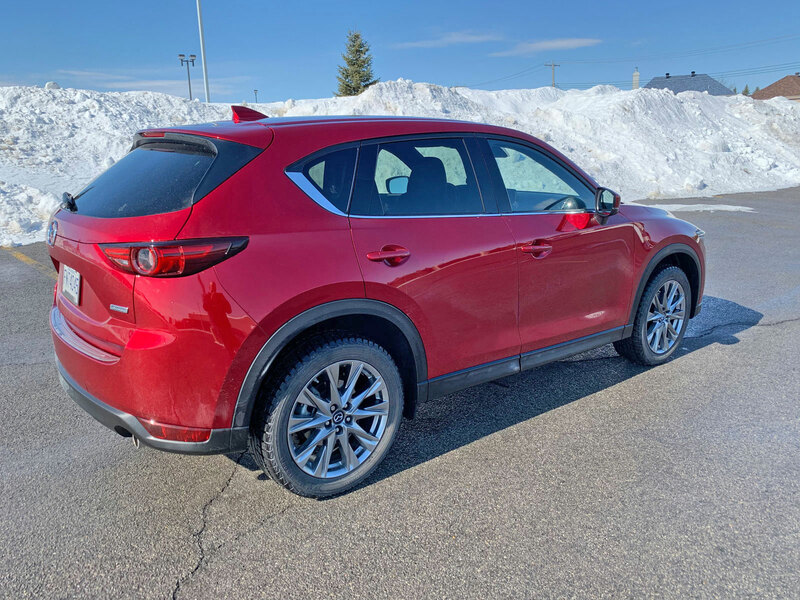 It packs more punch than the naturally-aspirated option and thankfully Mazda stayed away from using a continuously variable transmission and chose to pair it with its six-speed SKYACTIV-DRIVE automatic. 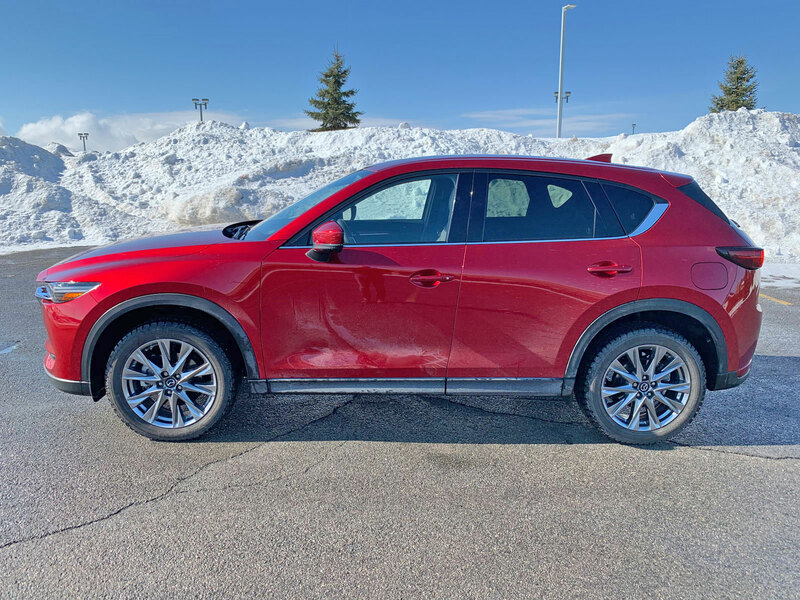 The CX-5’s acceleration was smooth, crisp and readily available whenever I needed it. If you don’t need the larger motor, the base 2.5-litre four-cylinder will still get the job done with its 187-horsepower output. The new G-Vectoring Control Plus is standard on all trims and serves to improve handling response and vehicle control by using small changes in engine output to shift weight to the front tires whenever the driver turns the wheel. Those adjustments may not be perceivable during every day driving but I can say the CX-5 handled extremely well. 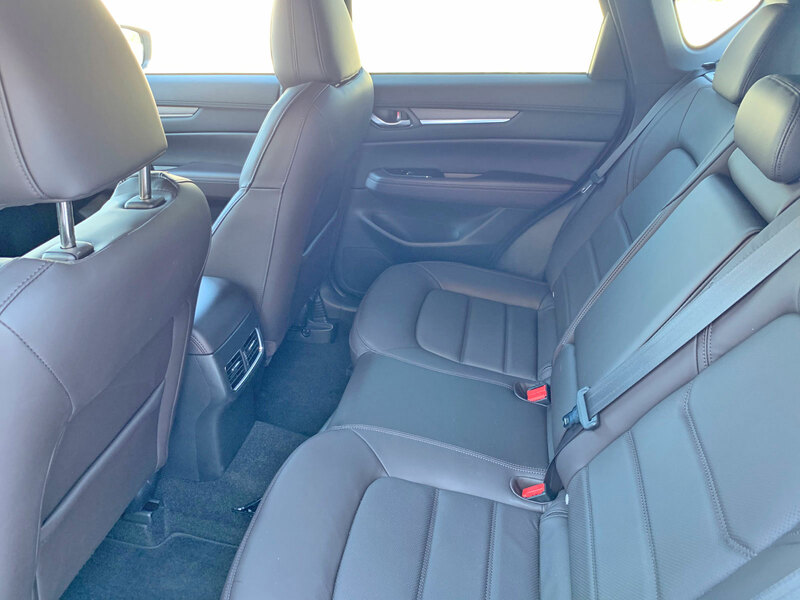 The ride quality overall is something you’d expect to find is much more pricey crossovers. I do like the size of the CX-5 (especially compared to the tiny CX-3 I just tested the week prior). 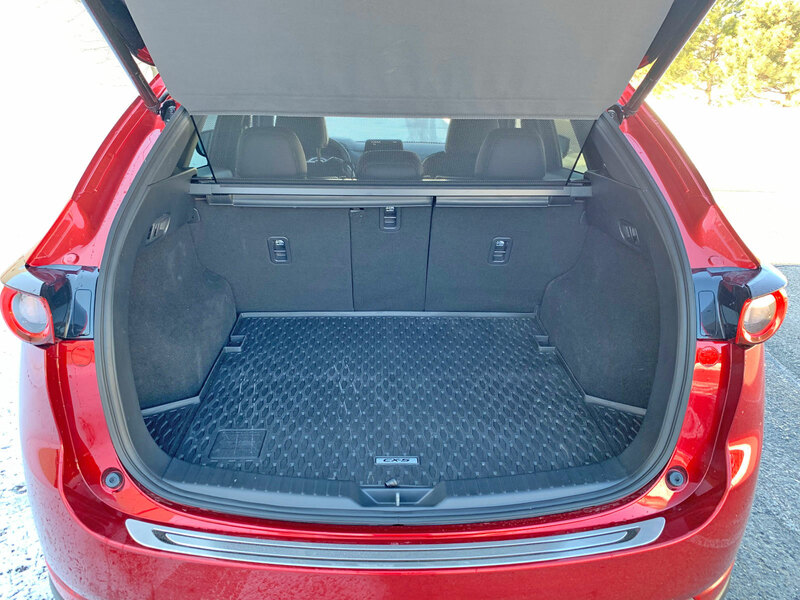 It’s still a compact crossover but you have room for five adults and trunk space to hold luggage, sports equipment or whatever else you need. 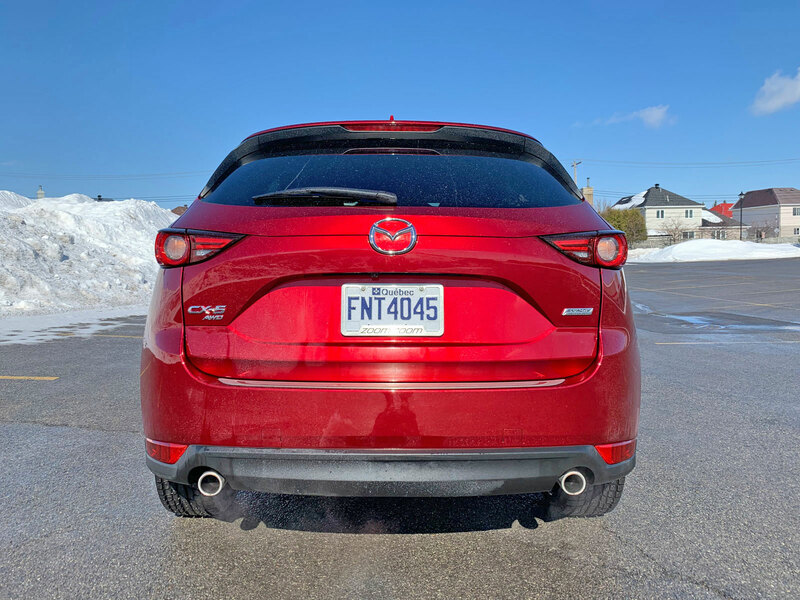 The CX-5 has some still competition in the compact crossover segment. It ranks fifth in 2019 sales behind the Toyota Rav4, Honda CR-V, Ford Escape and Nissan Rogue but could easily make a play for 3rd place as the numbers are quite close. It’s clear to me that it’s every bit as good as the top sellers – possibly even better. 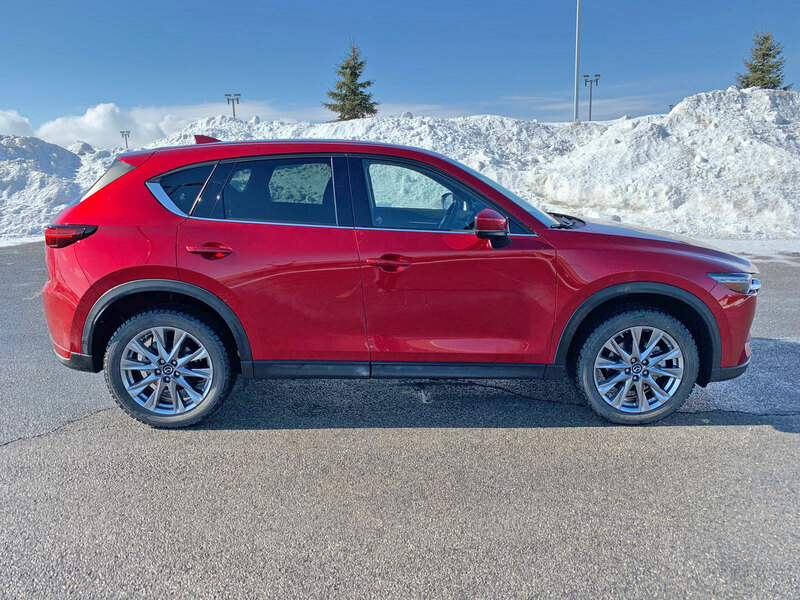 The starting price for a front-wheel drive CX-5 GX is $27,850. Our test vehicle which was the Signature edition rings in at $40,950.